James Hardie siding for your Colorado home. Home \ James Hardie siding for your Colorado home. Have you heard of James Hardie fiber cement siding? Are you considering this as a new siding choice but would like to learn more about this product? And find out why architects, builders, contractors, and homeowners up and down the Front Range are raving about this product? 2. Many Colorado homes were originally built with wood siding. Beautiful and durable, but quite dangerous in the mountain communities that come under threat of wildfire every summer. With the James Hardie siding products, you can have the gorgeous look of traditional wood siding, even cedar shingle siding, but with a non-flammable product that simply will not add fuel to a fire. 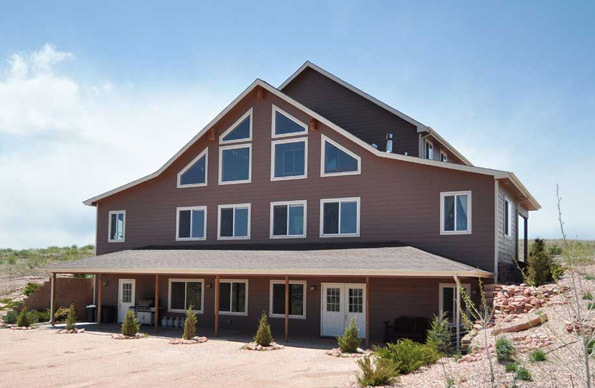 We consider this one of the major benefits of fiber cement siding in the Colorado mountains. 3. Now, let’s talk maintenance. Do you want to have to repaint your siding because the sun has faded it in just a few short years? No, you want a siding with the James Hardie ColorPlus technology, warranted to need no repainting for up to fifteen years. 4. And what about birds and bugs? Do you want termites munching and woodpeckers nesting? No! So again, James Hardie siding might be beautiful and come in a wide variety of colors, trim colors, and styles of boards, but it apparently is not remotely tasty or digestible to little beasts. 5. Last, but not least, let’s talk environmentally friendly. James Hardie uses sustainable materials and goes out of their way to make their manufacturing process as “green” as they can. This is an international company committed to sustainable products and eco-friendly manufacturing. 6. What about cost? Would you be surprised to hear that James Hardie fiber cement siding offers the highest ROI for a home improvement option, higher even than adding another bathroom to your home. Does this siding product have any “cons?” In our nearly fifteen years of installing it, we’d have to say we haven’t found any. Why not give us a call today for more information, to see the James Hardie line and choose colors and styles for your Colorado home, or to ask us for a bid on the job?